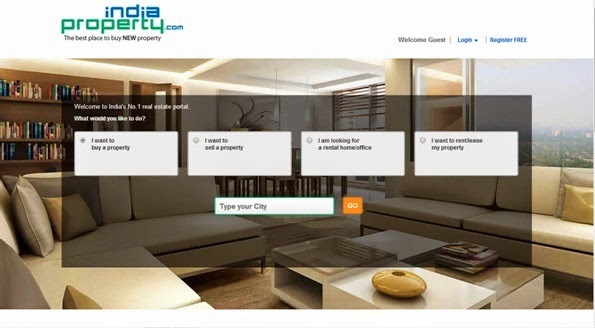 Indiaproperty.com is NO 1 property and real estate site in India. This website has mainly four options to find the properties easily like - want to buy a property, want to sell a property, looking for a rental home/ office and want to rent/ lease property. From website, you can also find the properties in India by the major cities links such as properties in Kolkata, properties in Pune, properties in Delhi/ NCR, properties in Mumbai, properties in Bangalore, properties in Chennai, properties in Hyderabad, properties in Madhya Pradesh, properties in Chandigarh, properties in Gujarat, properties in Kerala so on. This online property portal provides 24x7 customer services through Toll free no – 1800 3000 5511, International helpline – (+91) 928 100 1111, Live chat, Email id- info@indiaproperty.com, FAQS and Feedback. Group portals are Indialist.com, Assistedproperty.com, Bharatmatrimony.com, Communitymatrimony.com, Elitematrimony.com and Indiapropertyagents.com. Social initiatives through Bharatbloodbank.com, Bharatgreenhands.org, Bharateyebank.org and Abilitymatrimony.com.